Whether it is a resurgence of indigenous identity or as in recent times, just political posturing by populist governments, a number of places from Peking to Pondicherry and Bombay to Burma, have undergone name changes in the past decade. Could I locate a renamed city among the photos in my archives for the story challenge: letter Q? It appears I could, and I did! 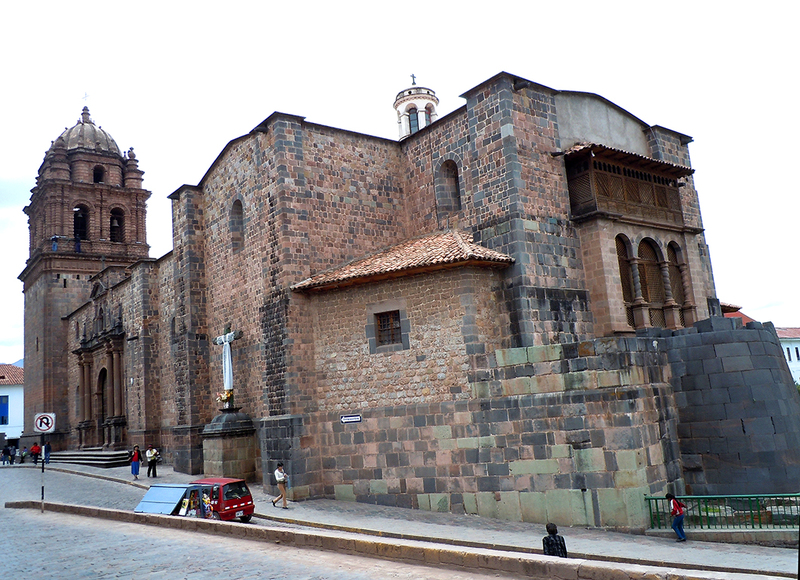 The capital of the Inka empire and the cultural heart of present day Peru, Cusco was always known to the native Quechua people as Qosqo meaning ‘Navel of the Earth’. (How many navels can the earth possibly have?) 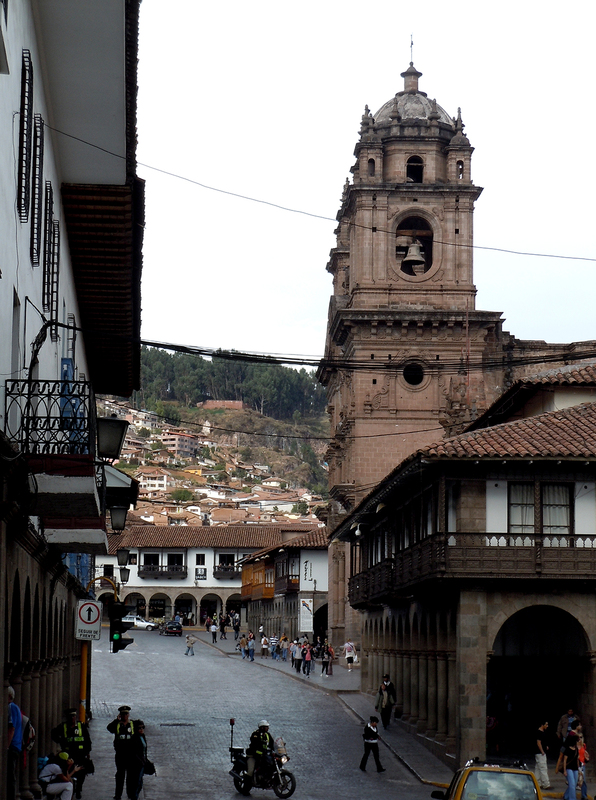 After the Spanish invasion led by Fransisco Pizarro in 1533, Cusco was corrupted to Cuzco. The derogatory implications of this colonial adaptation led to the spelling being officially changed to Cusco in 1976. Although considered the oldest living city in the American continent that has been continuously occupied for about 3,000 years, much of Qosqo’s history has been obliterated by its conquerors. And yet Qosqo and the surrounding ‘Sacred Valley’ are inherently Inkan, and the descendants of this short lived empire, continue to live in Inka houses, farm on Inka terraces, and use water supplied through Inka channels laid out with such precision and care! Perched over 11000 feet above sea level – a fact that demands at least a day of acclimatization before one goes galavanting around the countryside – the city itself is still laid out much as it was in Inka times. 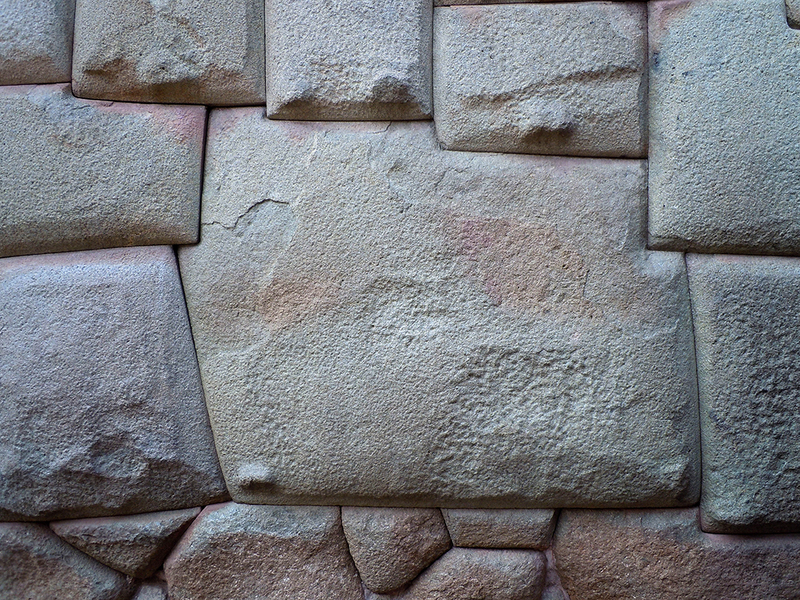 Conceived in the shape of a Puma crouched over the Saphi river with Pumakurko street serving as the spine, Sacsayhuaman the head, and the city center the body! The main visual impact of this Unesco World Heritage site though, is from the collage of glorious colonial architecture, built on the foundations of exquisite Inka palaces. 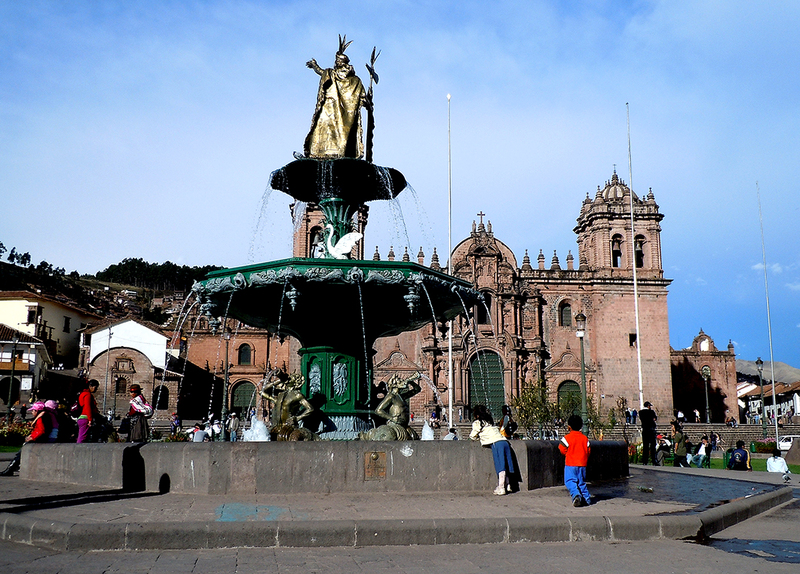 Complete with grand cathedrals, arcaded walkways, cobbled streets and a gorgeous plaza, that wouldn’t be out of place in Europe……..
…….except for the controversial gilded statue of Pachacutec, the ninth and greatest Inca, atop the fountain. And nearby, a memorial to Túpac Amaru II, great grandson of the last Inka, and brave martyr. You are most welcome Luann 🙂 Hope you manage to visit Peru soon. Nice place. I can imagine I’m there right now by looking at those stunning photographs! the stonework is amazing, I’ve seen it on TV and the potatoes, all those varieties, I wonder if anyone can tell the difference. This is a great post as always Madhu! Very interesting place to visit. Thanks for the post. Thank you for introducing the history. The sacred capital of the Inka is remarkable throught your lens. Thanks, Madhu! Thank you for taking me to a new place. The photographs are wonderful and make me want to visit in person. But until then I can be transported in place and time to marvel at this wonder. Wonderful tour of the city. Fabulous Cuzco photos. I swear, I think I know that blue door. Do you have a picture of it? It is amazing when we see pictures we recognise! Gilly posted a photo of a Caravanserai sometime back, and I was stunned to see the exact same image in my archives! It was a fascinating city, once I got used to the altitude. 🙂 Great photos, Madhu. Fascinating story and the beautiful photography to back it up. I always enjoy your travelogues, but this one really gets to me perhaps partly because of my ignorance of this particular city, its age, my interest in the prePizarro age. It puts me back on track with the interests of my younger years. If the text is not relevant or interesting it would not (or should not) be there. Here the Photographs beautifully support the text and the text puts every photograph in a context. A beautiful city that seemed to have been frozen by time. Love the pictures. I want to visit too! Fascinating! Thank you for this education and great photo tour! Clever, great research and excellent photos. Definitely on my wish list, great shots. Wonderful photos—they give such a sense of the place and its history. Great photos as always Madhu. The warrior, Pachacutec is cool. I think that’s one of the biggest (working) fountains I have ever seen! Nice work! Very interesting read, do you know as to why that statue of Pachacutec is controversial?